Welcome to FamilyGames.com. We hope you’ll enjoy looking over our collection of classic original games. All the games listed below are free to download and play. They work on computers running Windows XP or later. There is a modest one-time fee to access the full features of the games, but we do ensure that the free versions provide plenty of play value in themselves. If you’re looking for even lower costs per game, please visit our Collections page. If you own an Android phone or tablet, please check out our Mobile and web games page. You’ll find descriptions and details about our apps, and links to their Google Play pages. You can even try out the free sample versions of each game in any modern web browser, even if you don’t have an Android device. New blog posts about our game apps: If you would like to learn more about the app versions of our games, please read our recently released blog posts about Valvo and about Santa’s Secret Valley. You don’t need lightning-fast reflexes to play our adventure games, just a willingness to keep on exploring! And if you’re really lost, and really can’t puzzle your way through, there are hints to help. For reading age and up. Santa’s Secret Valley is a light-hearted graphical adventure with a Christmas theme. Can you rescue Santa’s magic items? Each puzzle you solve takes you further into the unfolding story, and one step closer to winning. Highlights in the free version include the Christmas Quiz, the TransDimensional InterLocator, and a train ride aboard the Secret Valley Express. In All Aboard For Santa you return to the Secret Valley on a new mission. Santa’s boat has washed up on shore, empty except for his pet monkey. Where can he be? Taking Santa’s own boat, the Rednose, you set out to find him. Such a fast, reliable, and above all durable boat is just what you need for exploring the lake and its mysterious islands! 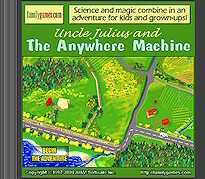 The famous scientist who invented the Anywhere Machine just happens to be your Uncle Julius. His Anywhere Machine takes you on a dazzling interdimensional quest that involves science, magic, and a society of surprisingly helpful gnomes! Along the way, you might enter a contest in the local newspaper, visit the auction, test your knowledge in a science quiz, go flying in a hot-air balloon... and lots more. Specifically for the little ones... Most of our games are designed to be enjoyed by just about anyone, regardless of age, but these delightful programs are meant specifically for the little ones. I Live at Santa’s House! I Live at Santa’s House! is an activity center game that lets kids aged 3–7 experience the delightful fantasy of being an elf in Santa’s house at the North Pole. Each session begins with waking up at the start of the day. As you explore the various rooms, you will find ten major activities and games to try, and a number of smaller ones (not all activities are fully enabled in the free version). The creative, non-competitive activities include testing toys, baking Christmas cookies, decorating the tree, and more! Twisted Tails promotes reading and language skills by presenting beloved fairy tales with a twist. Parents often wonder if kids are getting enough practice with basic language skills relating to reading, vocabulary and grammar. Twisted Tails is designed to give kids’ language muscles a pain-free work-out that’s so much fun they’ll keep on coming back for more! The vital skills of the mind... Our word games are kinetic, involving and addictive. They offer a powerful but painless way of building spelling skills and vocabulary. Alphen is the perfect game for those who enjoy a fast-paced word puzzle! The easiest level is suitable for children 8-10; the hardest will challenge serious puzzlers. Spell-Mell is a spelling, vocabulary and quiz game that includes numerous game modules, each in effect a separate game, plus an editor for creating your own modules. Although any of our games could be considered “educational”, they are primarily games. Our last two offerings concentrate on maximizing learning with as little distraction as possible. And yet, people still find them addictive! World Geography Tutor lets you learn the nations of Asia, Africa and Europe, and the states of the USA, with the aid of a proven quick-learning interface. 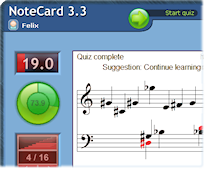 NoteCard is a fast, easy and fun way to learn the musical notes. Soon you’ll be reading music as fluently as you read this text!